Paul going over the route from Baker Lake to Gjoa Haven with Silas (on his right) and his son-in-law Peter who was translating. (Apologies for the lateness of the trail report... Base Camp Eric has been fighting the flu for the past week and has been home sick.) The weather is crazy! One day we have 25 below and a howling blizzard from the south, where every minute is focused on staying warm enough and not getting windburn or frostbites[atoz/windchill]. The next day it is above freezing and sharp sunshine leaves us drenched in sweat with soaking wet mukluks trying to avoid getting sunburned. For two days, we have been sitting in a blowing whiteout from northwest. Maybe it's because of the full moon.. HA! The last big blizzard we had was on a full moon (remember when we were getting buried in snow in the tent). We did not know this, but an elder in Rankin Inlet [link to town info] pointed out to us that we should always expect the weather to be very unstable around a full moon. So far he has been right! 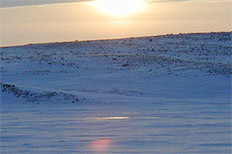 While we were in Baker Lake CBC NewsNorth reported from an Arctic summit on global warming in Cambridge Bay where a group of elders agreed that the knowledge and skills to weather forecast, which has been crucial to the survival of the Inuit, no longer seems reliable. The elders have difficulty predicting the weather patterns as they have for centuries; they believe due to the more violent weather patterns caused by global warming. Silas, one of the most respected elders of Baker Lake, did predict this week to have lots of crazy weather shifts though. We met Silas because everybody told us that he would be the best one to explain the ancient route that we are following from Baker Lake to Gjoa Haven and onto Taloyoak (Spence Bay). And they were right - Silas knows the land around Baker Lake like the back of his hand. When we folded out the 7 or so maps necessary to cover the approximate 400 miles, he just took a pencil and started drawing, within ten minutes it was all laid out for us, along with spots to be careful of, big rocks, and places to look for Muskox! Silas also offered to take part of our very large Science Diet dog food resupply that we picked up in Baker Lake, and bring it to his cabin a little more than 100 miles north of Baker Lake - about 1/4 of the way to Gjoa Haven. This sounded great to us, since it would lighten the sleds a bit so we could travel faster. The day the crazy winds began we had just reached his cabin. That was nice. This way we are more protected from the wind. Besides how the constant weather change affects us mentally, the weather is, without a doubt, what can get us in trouble. It is easy to understand why we worry about the cold, but unusually warm temperatures can be of equal concern. For example, when it was so warm the other day... the sun literally baked both us and the dogs. The danger of sunburn is very high because of the extra sunlight being reflected off the snow and ice, and of course, the harmful Ultra Violet mukluks get soaked, too. If they are not dried out by the next day and the weather changes for the worse, everything freezes solid. Then we would really be COLD!! Of course, there are many dangers when you travel by dog team through the Arctic, but it is not something that we think about a whole lot. In many ways, it is not any more dangerous than crossing the street in New York City. Something unexpected can happen in any situation which can put you in danger if you are not prepared. The key out here is trying to stay prepared for the worst case scenario every minute you are awake... or sleeping. Realize that we both do not feel scared or in danger out here very often. We are very careful to make sure safety is behind any move we make. Our extensive experience and being good at what we do dictates that our every action is based on safety. Probably our most important safety measure is to always be ahead of the game, never postponing anything - even the simplest of tasks, and always keeping in mind that the situation can become bad. On a beautiful day the weather can change. You will only be getting more hungry if you postpone starting to move around to get warm again, your body will cool further in the meantime. This way of thinking is simply built into our everyday routine. See the "glare" spot ..that's one of the spots of bad ice in front of the cabin!! Consider the following precautions we take: every night before we go to sleep we fill our lantern with fuel, put the matches and our head lights at an arm’s length - even though, at this time of the year, it is light out when we wake up at six. But, let’s say the ice starts cracking around camp in the middle of the night and we need to get up and out in a big hurry. We know that the lantern is ready to be turned on. The same with stove for heat. We also make sure we fill this every morning before we pack down camp. Here’s another example: we are traveling, big winds surprise us, the windchill dips below 100 as we set up camp and handling the metal stove with "brittle" hands, but we know we have to make only a few moves to get the heat going because it is all prepared and ready to go. Lets say one of us falls in front of the sled and gets hurt by the sled, it is important to immediately be able to give this person shelter, which is why we always lash our bivy bag on top of the load on the sled. This way we can pull it right off first thing and get in there to remain warm. These and all other little details, a lot of which we don't even think about anymore, makes up a very set routine of "how we travel.” Our routine and way of doing things are the same everyday and are as fast and efficient as possible. The better you are at this routine, the safer you are. Because when the storm hits, you are well prepared, you know exactly what to do - you are almost on autopilot. Hanging on the handlebar of Milles sled is a "throw bag". Inside is 50 ft of rope which unfold when thrown so that you can grab it and pull yourself out of the water. But of course no matter how prepared, we still have something we personally dread the most. Mille’s worst fear out here is bad ice, especially bad ice which disappears underneath the sled due to strong current. This is for a variety of reasons such as narrowing of land, waterfalls in the area, spring melting, strong winds (when on ocean), dams, beaver dams, and where rivers come into and out of lakes. As you can see, that’s quite a list of factors to keep in mind while being on the look out for bad ice. So as for everything else, we follow rule NUMBER ONE: STAY ALERT. In this case, look at the map, read the ice, and follow the ears of your lead dog (they can hear ice cracking before we can) especially when on rivers or small lakes. This is actually going to be our challenge traveling the next days. Right out in front of Silas’s cabin there is bad ice and open water. We knew ahead of time because Silas told us, but we should have known anyway as the river becomes very narrow at this spot. If one of us should fall through the ice, the first thing to do when out of the water and away from the bad ice, is to roll around in the snow! The snow will act like a sponge pulling the water away from our body. Next is to get that bivy bag off the top of the sled, undress and jump in there. If still fit to travel, we would find the spare clothing bag, get some dry clothing, and continue. If not, the other person would set up the tent and get the heat going ASAP. Paul’s worst nightmare is being separated in white out conditions where the snow blows around so hard you can not see anything. Remember, in an earlier report, [link to that one] we told you how we thought we had gotten separated and how we stopped immediately, looked at a clock, and started to make as much noise as possible, like making the dogs howl. If we had not found each other, each of us would have set up camp and waited out the storm. We can do so because both sleds carry a full "tent unit.” That means: a tent, stove kit, fuel, lantern, pots etc. We also carry it this way in case we lost one sled (for example through the ice). Finally, we carry two "tent units" in case something breaks. So far so good, though for the first time ever we are having to use our spare tent because all the tent poles were bent on the one tent in the blizzard. Hershey got a rather large cut on the inside of his leg in the beginning of the trip. We stitched it and put him on a course of antibiotics, and he stayed in the front room of the tent the first night. Next morning he was up and all ready to go again. He is a tough one! For that one he earns the "Polar Husky Star of the week. Still a puppy, Hershey has a very strong spirit and is always banging in his harness to go. He is in Paul's team and is one of his new favorites. If one of us or the dogs should get sick or hurt we also carry a thorough medical kit and both of us have extensive first aid training. If it is something we can not handle, we would call for help using our satellite phone. For this section on which we are traveling now, we actually borrowed an HF Radio in Baker Lake. If the situation is a matter of life or death, our last option is to ask for an evacuation using our ELT (Emergency Location Transmitter). This is similar to what airplanes carry. It is a small box the size of a large matchbox, with an antennae and a secured switch. If we flip the switch, a signal carrying our location is beamed to Washington, where it is routed to the nearest airport from where the distress signal is being sent. This airport then activates a search and rescue mission. Since nobody at this point knows the reason for the signal, they will expect the worst and will send everything possible in motion - if it means flying rescue material cross country through any weather or conditions, often putting their own lives at stake. We must keep all this in mind before ever flipping that switch! Now, many people think the factor we are most worried about out here is "wild animals." There are rabid foxes that are of concern to us in the arctic. They can transfer rabies disease to us or the dogs. But, of course when traveling on sea ice, like Hudson Bay we always have polar bears at the back of our mind. During the day, we scout for any "big white movement" (yep, hard to tell in a landscape of white). At night when we set up camp, it is with the bears in mind. We try to surround ourselves with the dogs who will warn of us of intruders (Timber is our main man for that task). Most bears are just curious, but if it isa serious encounter, we do carry a 12 gauge shotgun if our lives should be in danger. The first couple of shells are called "crackers"; when shot up in the air they make a very loud noise in an attempt to scare off the bear. We do not want to harm the bear if at all possible to avoid. First of all, we respect that we are on the turf of the polar bear - not the other way around. Secondly, killing a bear without a permit is considered a federal offense in Canada and can put you in prison for life, unless you can prove that your actions were in self defense which is of course very time consuming. Luckily, these days polar bears are not a worry... we are more worried about being run over by caribou! caribou. Have you ever thought about how you would prepare yourself if you were traveling like on a camping trip!? Join the "My Arctic Engine" and give us your input in the Survive Alive Collaboration Activity!